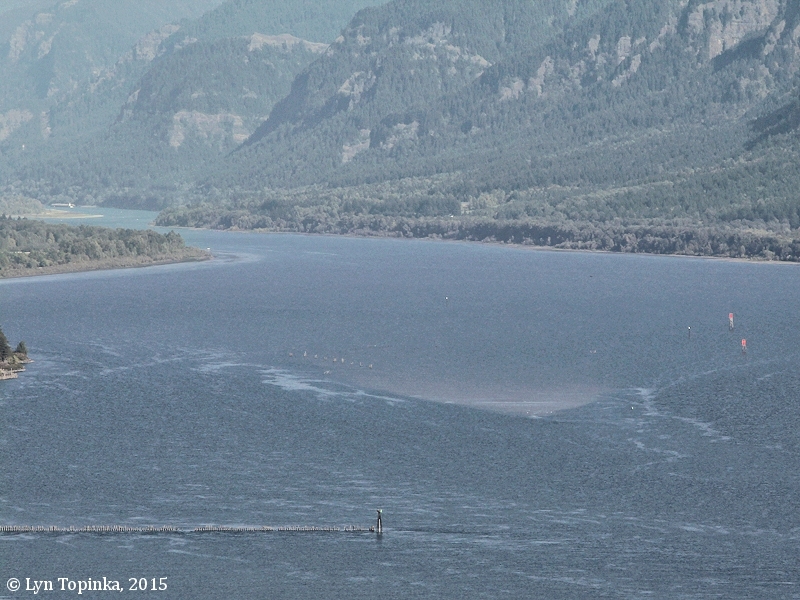 Click image to enlarge Skamania Island, Washington, as seen from the Cape Horn overlook. Image taken October 27, 2004. Skamania Island, Washington, is a 1-mile-long cottonwood-covered island which lies in the middle of the Columbia River at River Mile (RM) 136. 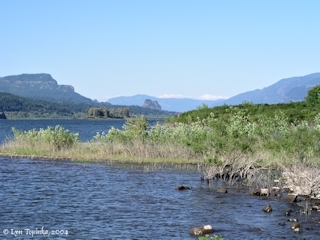 The community of Prindle, Washington lies a mile and one-half east of Skamania Island, and further upstream is Franz Lake NWR. Downstream on the Oregon side is Dalton Point. 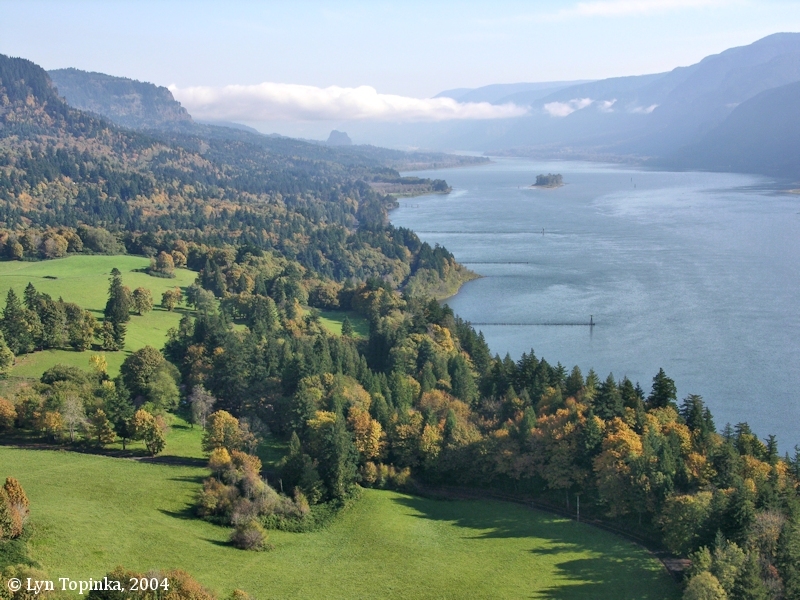 Skamania Island is managed by the U.S. Forest Service (Gifford Pinchot). 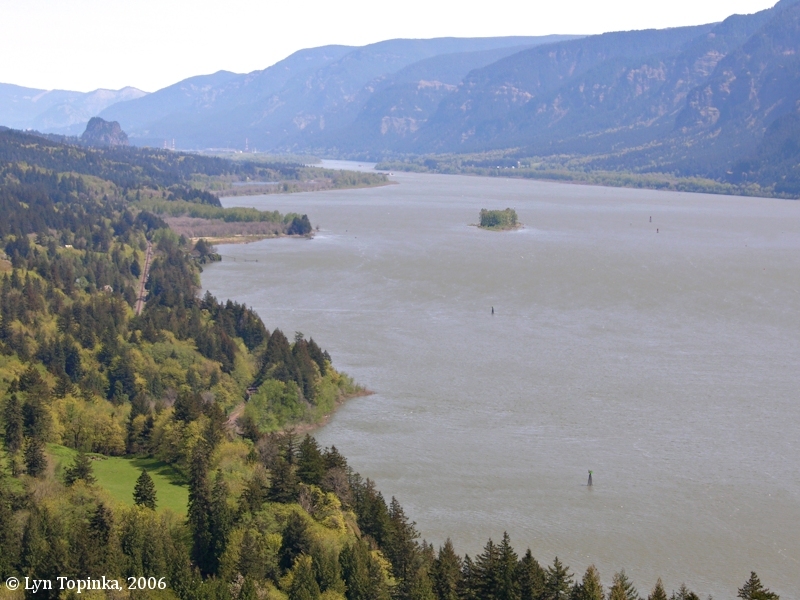 In 1805 Lewis and Clark passed through the area of today's Skamania Island but make no mention of the island. Their route map [Moulton, vol.1, map#79] shows no island. In 1841 Charles Wilkes of the U.S. Exploring Expedition, called an island "Long Island", located in the vicinity of today's Skamania Island. "... Here the channel is the whole width of the river; as it approaches Long Island it turns towards the south shore. Long Island lies close to the north shore, is composed of sand, with a very few bushes growing on it. Between it and the shore there is a narrow passage for barges and boats, which may be used to avoid the strength of the current when ascending the river. Seven miles above Long Island is the head of navigation, near what was named Castle, at Observatory Point, on the north shore. 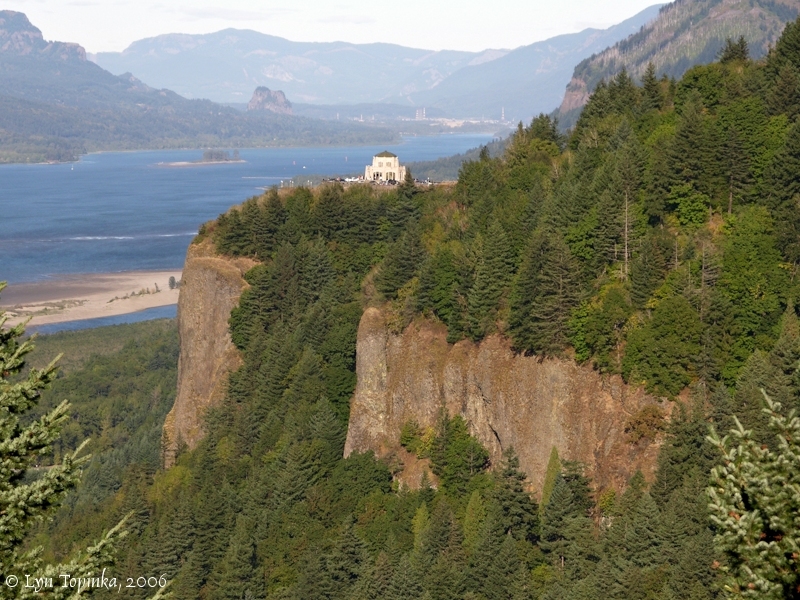 ..."
"Castle" is Beacon Rock. However, this web author is not sure which of today's locations is "Observatory Point". The 1948 U.S. Coast and Geodetic Survey (NOAA) map shows Skamania Island to be just over one mile long and 1/2 mile wide. It is not named. In 1984 T.M. 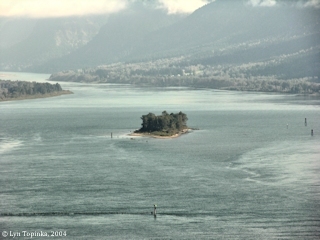 Nutting, Commander, U.S. Coast Guard, and Charles E. Harrington, Chief Geographer of NOAA/National Ocean Service, requested that the island be named "Skamania Island" after "local usage". The island was described as "island, 2.4 km (1.5 mi) long, in the Columbia River 1.9 km (1.2 mi) E of Prindle" and "Island - in Columbia River, 1.6 km (1 mile) long, 1.6 km (1 mile) NNW of Multnomah Falls, T1N, R6E, Sections 7 & 12". The U.S. Board of Geographic Names made "Skamania Island" the official name in 1985. Click image to enlarge Skamania Island and Beacon Rock, Washington, from Dalton Point, Oregon. Skamania Island is in the middle left (treed area in the Columbia). Image taken June 27, 2004. Sometime between my images of 2006 and 2015 from Cape Horn, Skamania Island was eroded away. The Oregon Department of Fish and Wildlife makes reference to its disappearance by June 2012. 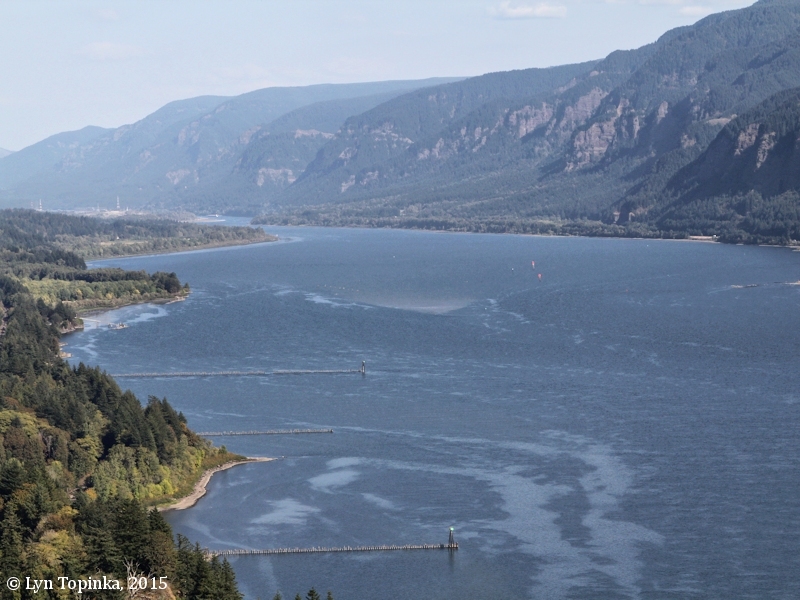 "The current language for the sturgeon angling closure below Bonneville Dam during May 1 - August 31 references the "upstream exposed end of Skamania Island". 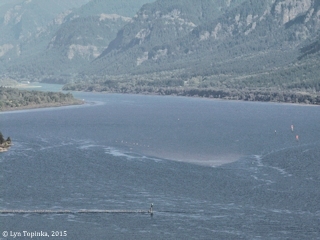 Due to high flows over the past few years, Skamania Island has eroded and is no longer an accurate reference point. Staff proposes modifying the language to reference existing markers on both sides of the river and removing the reference to Skamania Island." Source: Oregon and Washington Departments of Fish and Wildlife Joint Staff Report: Summer Fact Sheet No.3, June 28, 2012. Click image to enlarge 2004 ... Columbia River looking upstream from Cape Horn, Washington. 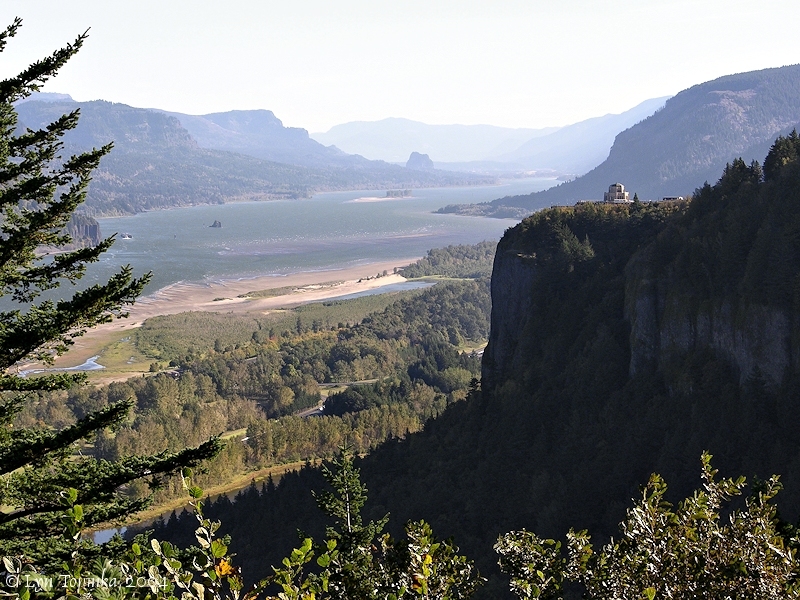 Skamania Island and Beacon Rock are in the distance. Image taken October 27, 2004. Click image to enlarge 2006 ... Beacon Rock and Skamania Island, as seen from the Cape Horn Viewpoint. Image taken April 22, 2006.